I have been lucky to be a part of Oregon Humane Society’s Animal Physical Therapy Program almost since it began about four years ago (then called the OHS Swim Team). Since that time it’s grown from one staff member, three volunteers and three hydrotherapy providers, to a thriving program of two staff members, 20 volunteers and eight providers who donate a variety of therapy services. These include swimming, chiropractic, acupuncture, laser therapy and massage. The program focuses on a holistic approach that combines conventional shelter medicine with alternative therapies to treat special needs shelter animals. Anywhere from 12-15 animals are served each week through the OHS Physical Therapy Program. Meet Cyrus, below. This super lovable senior was a long-term resident who was adopted last week. He went swimming and also received laser therapy and massage. As you can see, he took to therapy quite well. 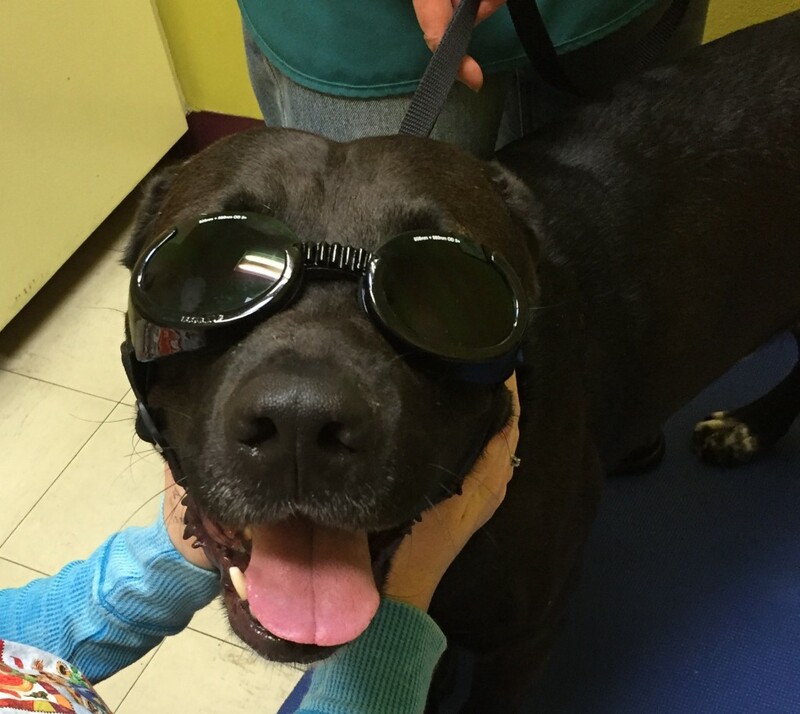 During laser therapy everyone wears safety goggles to protect their eyes and patients are no exception. Lou, pictured below, rocked the doggles. Blake, below, was all rest and relaxation at his recent acupuncture appointment. Beloved long-timer Aslan was just adopted as well and we couldn’t be happier. This active boy swam twice a week and received acupuncture treatments to help relieve anxiety and boredom. The best part of volunteering for this program is witnessing the transformation that the animals undergo thanks to this combination of therapy, a break from the busy shelter, and one-on-one time with volunteers. Program participants vary widely but include pets with injuries, those recovering from surgery, seniors, animals with mobility problems and/or chronic conditions, overweight animals, those who are suffering from depression and anxiety and animals that are just plain stressed. In addition to the many physiological benefits of therapy, animals love the break from the shelter and the extra attention they receive. Of course none of this would be possible without our generous providers, who we especially want to thank for their time and support: Acuvet PDX, Dogs Gone Swimming, Irvington Veterinary Clinic, Livingston Chiropractic, Lombard Animal Hospital, Oswego Veterinary Hospital, ResQ Animal Massage and Thrive Acupuncture. It’s the season of thanks and I’m grateful, once again, for the animals of the world and the people who love and heal them.